I really thought I could make it. The dish seemed so simple; a plate of creamy polenta, layered with soft, savory taleggio and parmesan, the rich yolk oozed like a golden lava flow as I punctured the egg with my fork. It was sublime, and of course I kept thinking to myself, I could totally do this at home, nothing to it. Piece of cake. Um yeah. In capable hands, maybe. My attempt at recreating the dish I had at the wonderful Tasting Kitchen in Venice weeks earlier was a total flop. To be honest, I’m not really sure where I went wrong. All I can remember was sitting down with a bowl of this stuff after wasted hours in the kitchen cooking and shooting and not even being able to finish even half of it. It was just blah. So bad, that the previous fond memories of the original were muddled and tainted by the failed copy. I had basically written off the idea until a few days later, while shopping for another dish, I had a light bulb moment. What if I replaced the polenta with risotto? And while I’m at it, add some bacon, because who doesn’t love bacon and eggs. And ditch the taleggio because the wet sock thing wasn’t doing it for me. Ok, so I ended up with a completely different dish. Every bit as good as the inspiration, if not better. 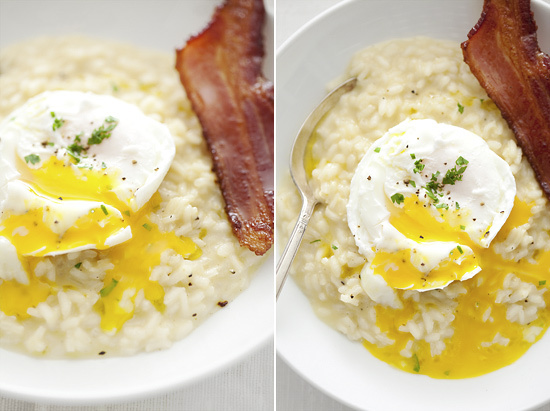 The poached egg goes so well with the cheesy risotto, and the texture of the rice is more comforting than polenta. 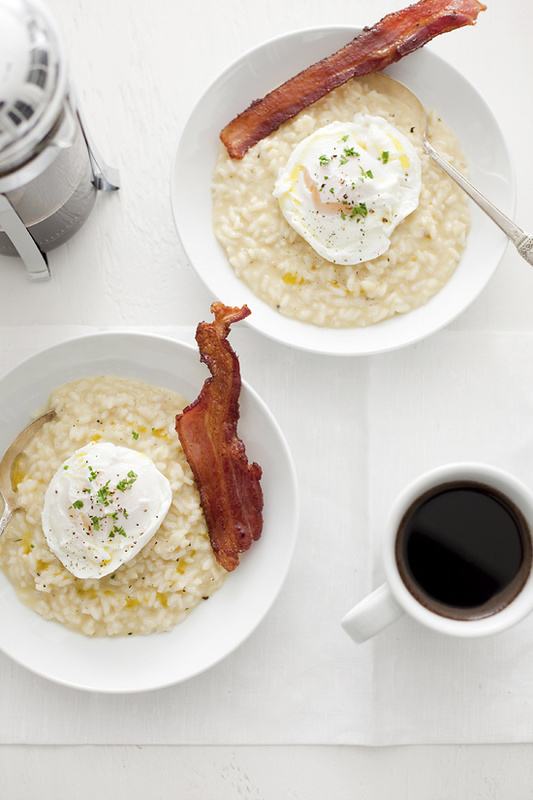 It is a little more breakfast-themed, which is totally doable on a weekend morning, but if we can have breakfast 24 hours a day at Denny’s, why not this risotto for dinner? Just skip the coffee if you plan on sleeping after. Mmm… farmers’ market eggs. Get the best ones you can, because it’s all about the eggs! For cheese, I went with a Comté, or French Gruyere. Melts nicely and partners up well with Parmesan. There’s that lava flow I was talking about. I like my risotto cheesy, so add according to taste. Makes 2 servings. Bring the stock to a boil; reduce to a simmer. In a medium saucepan over medium-high heat, warm olive oil. Add the shallot and saute until translucent, about 1-2 minutes. Add the rice and toast in oil for 2 minutes. Stir in the wine to deglaze the pot. When almost all the liquid has disappeared, add enough stock to cover the rice. Add freshly ground pepper and a good pinch of salt. Lower the heat to maintain a vigorous simmer; stir occasionally. When the stock is almost gone, again add enough stock to cover rice. Continue this way until the rice is just al dente, about 20 minutes. Remove from heat. Add butter, cheese, and stir. Drizzle with extra virgin olive oil if desired. 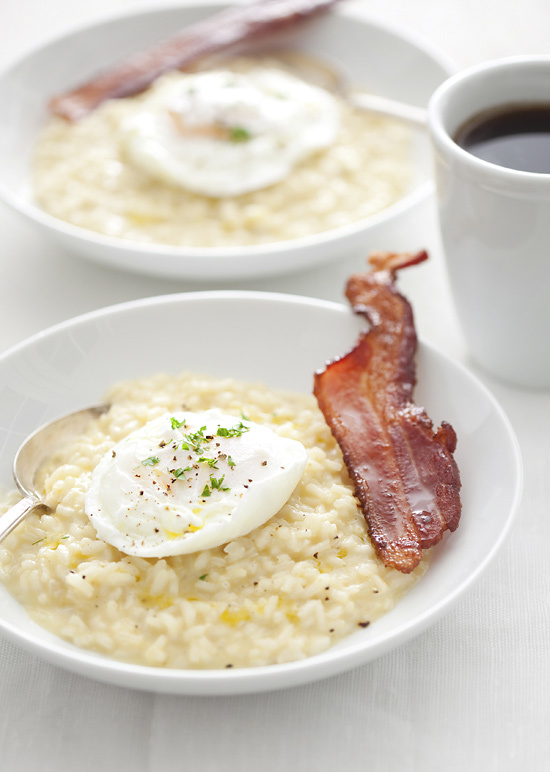 Serve immediately topped with bacon, eggs, and parsley. Fry bacon in a large saucepan or dutch oven (helps prevent oil from splashing all over the place). Flip occasionally for even browning and cook to desired crispiness. Poach eggs in simmering water for 4 minutes, either in a medium saucepan or a large shallow saute pan. 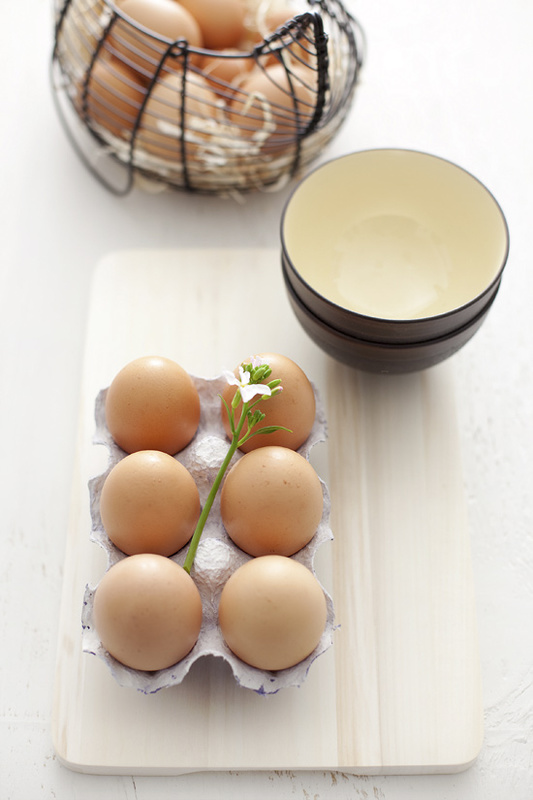 Check out this video/discussion on the different methods of poaching eggs. I’m too lazy to rehash all that here. I have to tell you about my new favorite pasta. I’m absolutely in love with orecchiette (oh-rayk-kee-EHT-teh), a dimple of a pasta with a funny name. Orecchiette, which actually means “little ears” in Italian, is typically made by pressing the thumb into a small round of pasta dough against a wooden board. The resulting rough irregular shape does resemble a little ear, though the commercially available versions are more uniformly dome-shaped. 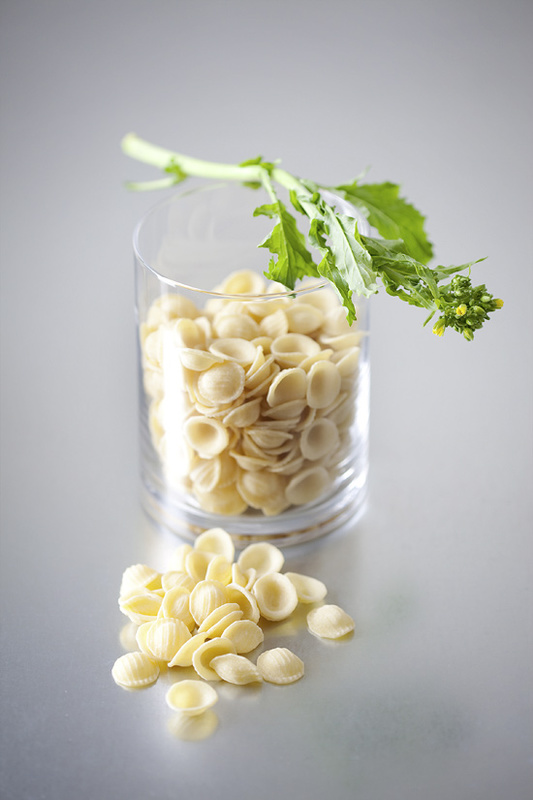 A good quality orecchiette will have a textured or ridged outer surface, which beautifully clings onto sauce while the saucer-like concave side is perfect for grabbing onto little nuggets of goodness. With its toothsome bite, this pasta eats surprisingly heartily, which also makes it well suited for pairing with vegetables and lighter ingredients. 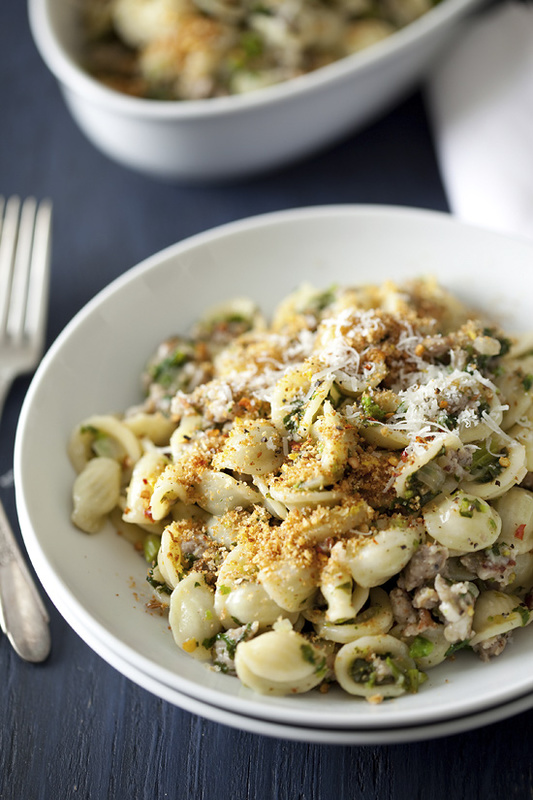 My favorite preparation of orecchiette is simply with Italian sausage and rapini (also known as broccoli rabe). The combination came to me while perusing my local market as I was trying to let the freshest ingredients inspire the dish. Here I was thinking I was being creative and resourceful, to later find out that orecchiette with sausage and rapini is quite a classic pairing. So much for originality, but hell, it sure is tasty. The key to cooking with orecchiette, in my opinion, is to make all the ingredients similarly sized. In this dish, the ground sausage meat, diced onion, and chopped rapini are all easily picked up by the dimples of the pasta, cradling flavor with every fork or spoonful. On the topic of flavor, the semi-one pot nature of this dish helps to build layers upon layers of it. The sausage browns first, then the onions get sauteed in the pork fat. The rapini and garlic gets cooked in the same pot as well, the steam from the leaves helps pull off the fond or brown crusty bits. A generous handful of cheese at the end lends richness and an extra hint of salt, while the lemon-scented breadcrumbs adds a nice textural contrast and a bright citrusy note. If you’re pressed for time, skip the breadcrumbs but do add the lemon zest to the dish. I do have to admit that I haven’t tried making orecchiette any other way, though many ideas come to mind (with gorgonzola and crumbled bacon, cold with pesto and ripe cherry tomatoes, or a with rich hearty bolognese). I’m just content for now to have it this way, because it’s so good. If you can’t find rapini, regular broccoli will do just fine. Makes 4 servings. For breadcrumbs, melt butter in a saute pan over medium heat. Add breadcrumbs, stir and toast until golden brown, taking care not to burn the crumbs. Remove from heat, stir in lemon zest. Spread out crumbs onto a baking sheet to cool. Brown sausage in a large saucepan over medium heat. Once sausage has some color, add onion and cook until sausage is no longer pink inside and onion is soft and caramelized. Remove sausage and onion mixture and set aside. In the same pan, heat olive oil over medium heat. Add garlic and a pinch of red pepper flakes, then add rapini. Cook rapini until wilted and soft, about 5 minutes. Salt and pepper to taste. Remove from heat, add juice of 1/2 a lemon, and let cool for 5 minutes. Transfer the rapini to a cutting board and chop finely. Return rapini, sausage, and onion to saucepan. Mix well and set aside. Meanwhile, bring a large pot of salted water to a boil. Cook orecchiette al dente or according to package instructions, approximately 10 minutes. Drain pasta, reserving cooking liquid. Add pasta and cheese to the saucepan with rapini and sausage, stirring to incorporate all the ingredients. Add remaining 1/2 lemon juice. Add reserved cooking liquid a little at a time, stirring until the pasta is not dry. 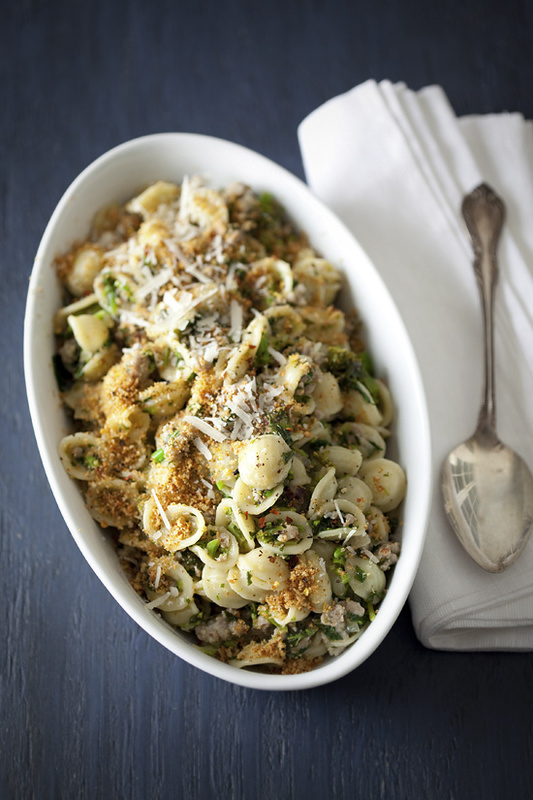 Serve pasta in bowls and top with breadcrumbs and additional cheese.